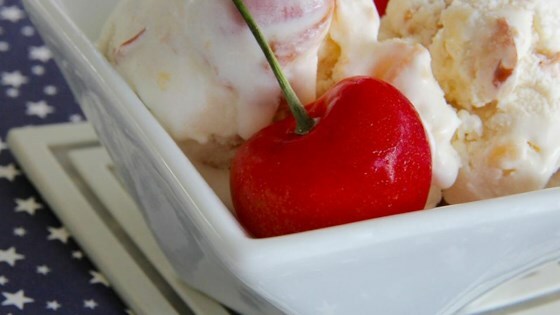 "This recipe makes classic vanilla ice cream with a slight undertone of almond and dotted throughout with fresh cherry pieces." Combine the cream, milk, and sugar in a bowl. Stir until the sugar is completely dissolved. Stir in the vanilla and almond extract. Add the cherries. Pour the mixture into an ice cream maker and churn according to the manufacturer's instructions. Transfer to a freezer-safe container and freeze for at least 2 hours before serving. I had really high hopes for this but it was just okay. Grainy. This is the best ice cream I have ever had! The only thing I did different was add some vanilla bean. OMG this is the best ice cream ive ever tasted. I usually am a sucker for the black cherry Ice cream so i decided to try this one, very very good. I used a jar of drained marchino cherries and it was very yummy! Loved this!!! I love the hint of almond. I used marachino cherries (two small jars) instead of fresh cherries.....it was the bes!! This was so good, I did cut the almond extrct in half. We didn't miss it. The only problem with this recipe is cutting and pitting fresh cherries. But oh so worth it.